HiI’m Ruth. I like to draw, paint and make. I love patterns, beautiful, intricate, juicy patterns. I love patterned textiles and textured fabric. I love layers and creating texture. I love artwork that makes you want to run your hands all over it and take it apart to see how it was made. I have a fascination with and derive great satisfaction from creating a space or shape and then filling it entirely with pattern or texture using a variety of mediums. 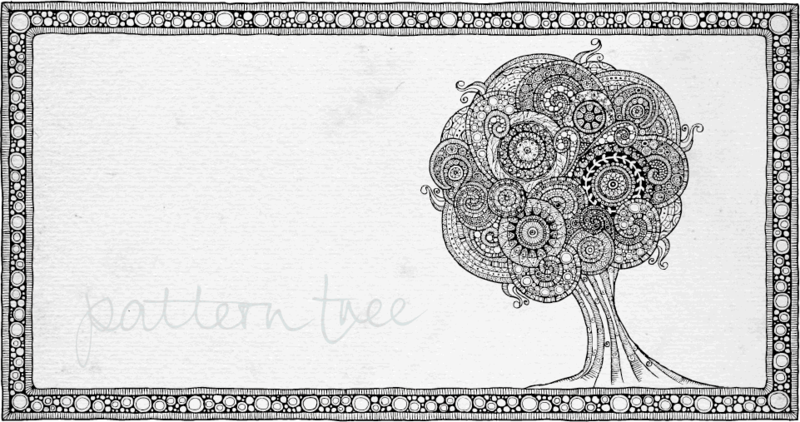 Pattern Tree creates very versatile, uniquely intricate, beautifully hand-drawn illustration and surface pattern design. Designs can be provided as a high quality digital file for use as product surface pattern or bought in the form of high quality prints and originals. Clients can commission and license bespoke designs for a wide range of needs for example gifts, textiles, stationery, homewares, technology accessories, promotional material, website headers and CD album covers. Commissions can be made by contacting me here through the website and other designs and products are available to buy through several online outlets including etsy.com and society6.com. Please help me by telling me what you think, check in often to see what happens, SUBSCRIBE to keep up and maybe say hello! Copyright © 2011-2012 PatternTree.co.uk All Rights Reserved.